- The multinational document software company has recently launched significant improvements to its DocPath ResourceBox solution. The latest enhancements are aimed at helping DocPath clients deal more efficiently with the challenges related to all document process resources. DocPath, a leading document software solution manufacturer and provider, recently announced significant enhancements to its DocPath ResourceBox document software. Main document software features of ResourceBox include rapid resource retrieval (images, data files, different types of documents, etc.) from different sources, conversion of file formats, and file merging –all in a single document process. 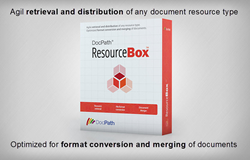 DocPath ResourceBox was launched in 2016, for companies that typically use a wide variety of elements to generate their documents and with many business processes involved. In fact, at a time when client expectations around transparency and speed are rapidly evolving ang growing, companies of any size and area must connect with their customers through new ways of communicating, in the form of clear, professional and engaging documents received in record time. The solution to meet those challenges logically requires optimum management of all the resources and business processes involved in the document process. The latest features added to DocPath's ResourceBox document software address those needs by providing users with enhanced functionality for managing their document-related resources, as well as more performance and flexibility in running the document software solution. Thus, the ResourceBox document software visual Web tool is optimized with a more intuitive, clear and concise design, a set of icons and short, descriptive texts to enhance overall user experience, as well as new options for customizing the output document. One of the most outstanding new features is the option of stamping a document – a process for automatically inserting a text or image at a specific position and page in the generated document. As a result, for example, an insurance company that is generating its policies with DocPath ResourceBox by merging its general legal clauses with another document containing the particular conditions of each client, may add a brief legal notice, a logo, a date, etc. to the resulting document. In addition, DocPath engineers have also focused their efforts on significantly increasing the overall performance and flexibility of the document software solution by optimizing each of its components. As such, improvements have been made to ResourceBox Client – a component that stores previously requested resources in cache memory and, thus, considerably increases the efficiency of the entire document process as unnecessary repeated processing is eliminated. In short, DocPath has turned its ResourceBox document software solution into a comprehensive document-related resource management tool, providing the functionality that any company needs to efficiently manage, retrieve, merge and convert all the resources needed during the document process, in order to produce coherent and professional documents. Disclaimer: DocPath trademarks are the property of DocPath Corp. Other company, product and/or service names may be trademarks or service marks of others. Document Generation Examples A brief introduction to our document software solutionsA brief introduction to our document software solutions Brief introduction to our company and clients.Brief introduction to our company and clients.